Businesslike Oy has for several years topped surveys in their own business field. We want to exceed the expectations of our clients every day. In the respected corporate image survey for 2016, Taloustutkimus examined the personnel services field and assessed related businesses based on well-informed decision-makers’ comments and evaluations. Eleven of the most significant recruiting companies in Finland participated in the survey: Academic Work, Adecco, Barona, Businesslike, Eilakaisla, Manpower, Opteam, Poolia, StaffPoint, Student Work and VMP. 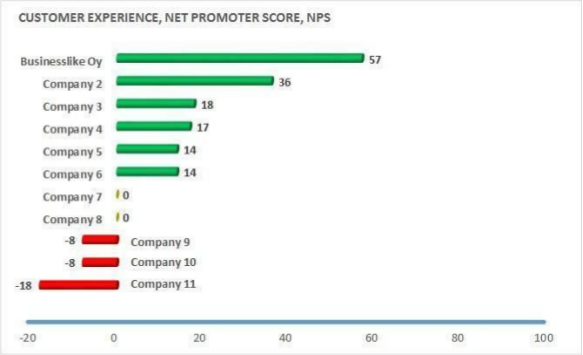 Businesslike had by far the best Net Promoter Score in the survey as a whole: NPS 57. According to a study based on data collected by Taloustutkimus, the average Net promoter Score for Finnish companies is 19. The overall mark given by customers to Businesslike was 8.9, whilst the average for the field in the survey was 7.8. In all the assessments linked with the company’s operations, Businesslike was the best on the basis of customer experience. Businesslike was assessed as clearly well above the others by reference to other operators in the field in the following areas: Reliability and Surety of Delivery, Speed of Delivery and Service, and Customer Service. Another point, worth noting is that in comparison to the other operators, Businesslike’s Marketing Communications and Prospects for the Future were considered to be significantly better. The survey was conducted from August through November 2016 amongst persons in a decision-making capacity. Altogether 268 respondents in the greater Helsinki area took part in the assessment in the personnel leasing field. The Private Employment Agencies Association regularly studies the work satisfaction and sense of relevance and meaning amongst temporary employees engaged by authorized agencies in the field. The most recent survey was carried out in spring 2016, and was implemented by Promenade Research/HR4. A total of 6,484 temporary employees participated in the research study from 37 authorized enterprises throughout Finland. The survey indicated that the employees regard Businesslike as a high-quality company and successful in its field. Businesslike’s image as an employer is, according to the research study, very good. The temporary employees are highly satisfied with Businesslike as an employer and engaging in personnel leasing work via the company.